There are many elements required to produce film & video, including physical and digital needs. 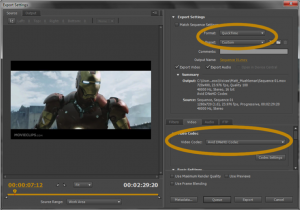 One often overlooked aspect of production is that of exporting video into its final format. 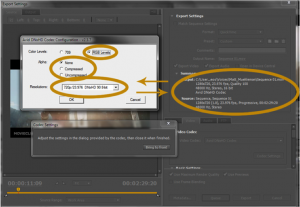 Exporting video can be complicated because of the number of file formats, codecs, etc. that exist. Plus, there isn’t one “right” method. Exporting video comes down to what the client needs or what the editor wants. When exporting, the editor needs to ask themselves a few important questions. Where will the video be sent? Will it be on a DVD or Bluray, broadcast TV, or the web? And how can the video be at its best/highest quality while retaining a reasonable file size? For the web, the most common file format is MP4 while using the very powerful and all around device-friendly H.264 codec. When working with H.264, it’s also important to keep in mind that bitrate is a large determining factor regarding video quality and file size (Figure 1). In addition, for the video playback to be smooth it’s a good idea for the export’s frame rate to match the original footage’s framerate. If the original footage is shot at 30 frames per second, export the video at 30 fps; if shooting at 23.976, export at 23.976 and so on and so forth. For broadcast, it’s best to export at the highest resolution possible. 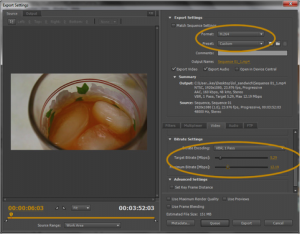 Usually, that’s done by exporting using either Apple’s ProRes or AVID’s DNxHD codecs. For ProRes, select Format>Quicktime, then underneath in the ‘Video’ tab in the ‘Video Codec’ box, select Apple ProRes 422 from the dropdown menu. Most of settings for ProRes may be left at their default values (Figure 2). When exporting with DNxHD though, a few extra steps need to be taken. 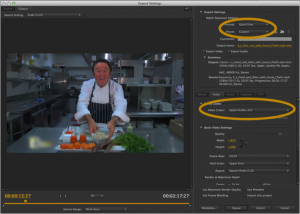 Select Format>Quicktime, then underneath in the ‘Video’ tab in the ‘Video Codec’ box, select Avid DNxHD this time from the dropdown menu instead of ProRes (Figure 3). For “Color Levels” choose RGB Levels, leave the “Alpha” set to None and under “Resolutions” select the resolution and frame rate that matches your original footage the best. The numbers next to those options (like 175, 115 and so on) are your data rate, also important for image quality (Figure 3.3). Then, for DVD/Bluray, there’s the preset option of MPEG2-DVD and H.264 Bluray. When working with MPEG2-DVD, keep in mind that that file format will break the video and audio down into two separate files, one for audio and the other for video. This time for video, the settings can be left at default for the most part, the only change to make is to change any HD video from Standard Definition (4:3) to HD (16:9) (Figure 4). 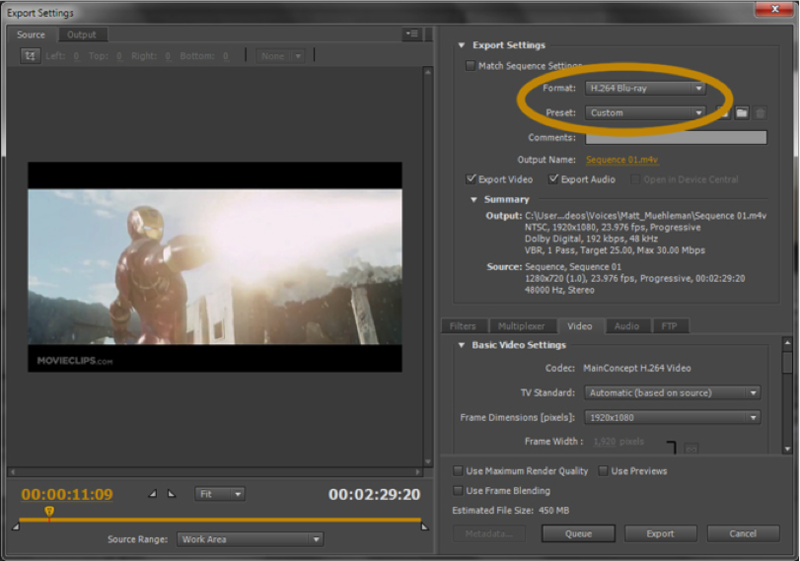 The bitrate may remain the same, but make sure to get rid of any letter boxing or whatever by converting to HD. The audio must also be changed just a tiny bit. The only option that is left is that of dealing with sound in MPEG2 –DVD. It is very much recommend it that the editor change the audio format to Dolby Digital from PCM (Figure 4.1). That way the file sizes remain reasonable. To export a file for a Bluray, choose H.264 Bluray from the list of formats (Figure 5). 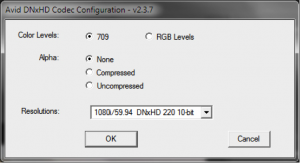 Same as with MPEG2-DVD, leave the settings alone and just select 1920×1080 as the Frame Dimensions (Figure 4.2). And finally, for sound, it’s also recommended that the audio setting should be put to Dolby Digital as well. Any other changes are not needed unless wanted. Hit queue or expert next and the video will render soon.